Explore a beyond ordinary route to unspoiled ethnic minority areas of Guizhou, where tradition and simplicity remain intact. Combine it with Fenghuang Ancient Town&apos;s charm and Zhangjiajie&apos;s precipitous World Heritage landscape. Visit ethnic villages with their own unique customs and life style. Challenge yourself on the Glass Walkway 1,430m above the ground in Zhangjiajie. Witness the ‘Natural Great Wall&apos; at newly discovered Yangjiajie. Experience minority culture and taste Tujia dishes in Fenghuang Ancient Town. Take the road from Guiyang to Kaili, Taijiang, Zhenyuan, and Tongren. See the ethnic villages of Guizhou, and get to know about their lifestyle and ancient craftsmanship. See an old town with stilted wooden houses lining the banks of the Tuo River. Explore the quaint and timeless environment. Its startling natural landscape became the inspiration for Avatar&apos;s Hallelujah Mountain. Take the ‘Stairway to Heaven&apos; and knock on &apos;Heaven&apos;s Door&apos;, after taking the world&apos;s longest cable car and climbing 999 steps. Your tour guide will wait for you at the arrival hall of airport with a smile and name plate. Travel to your hotel by private van and driver. Guiyang is the capital city of Guizhou Province, a charming region that is full of various minority cultures. From when you land at the airport, you will find mountains everywhere, where mysterious minority people are hidden, waiting for you to discover. Drive from Guiyang to Kaili (4 hours by car). When you arrive at Qingman Miao village, friendly villagers will hold a welcoming ceremony dressed in their traditional clothing, and greet you with home-made wine. You might have the chance to see their old way of dying fabric. Not far from Qingman is Shiqiao Village where their method of making paper from tree bark has a history of over 1,000 years. To show respect, you should drink the greeting wine. The wine is home-made from rice, tastes sweet, and is low in alcohol. If you don&apos;t drink alcohol, we can arrange a non-alcoholic greeting drink, or some other way to avoid awkwardness. Starting from Kaili, you enter less-developed rural China. Hotel facilities are not as good as in developed cites, and breakfasts are very simple, Chinese-style meals. To make your stay more comfortable, we prepare bread, butter, coffee, fruit, milk, and bottled water for you. Half an hour&apos;s drive north from Kaili is Matang Gejia Village, home to some 400 Gejia people. The Gejia are a very special ethnic group with a small population of only about 10,000 people, living scattered among several towns and villages. It was not classified as one of the 55 minority groups by the government. They are unique in many ways, including lifestyle, language, and costumes. They&apos;re known for singing, dancing, and making wax printings. Their costumes and headgear are all hand-made. The capes worn by their men make an imposing impression, like a general in ancient war time. Head back to Kaili and drive south for another half an hour to Jidao Miao Village, nestled in idyllic surroundings by the mountain side and flowing river. People live in wooden stilted houses of two or three levels, with domestic animals on the ground level and people on upper levels. They are a branch of the Miao ethnic minority, and their costumes are unique as women all wear long skirts. Drive about 3 hours from Kaili to Zhenyuan Ancient Town, then relax yourself and enjoy limestone mountain scenery as you boat on Wuyang River. Visit Green Dragon Cave&apos;s old architectural complex, a rare combination of Buddhism, Daoism, and Confucianism built 500 years ago. Enjoy your free time strolling in Zhenyuan Ancient Town, where many hundreds-of-years-old buildings, folk houses, and piers are well preserved. 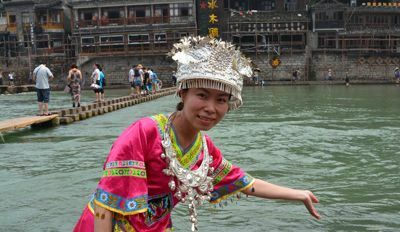 About 3½ hours by road from Zhenyuan is Fenghuang Ancient Town, home to Tujia and Miao ethnic groups. Wooden tilted houses line the banks of the Tuo River. The town is secluded and tranquil by day, and it becomes a place of liveliness with bars along the river at night. The night views of Fenghuang Ancient Town are particularly beautiful and attract many photographers. In your free time, it is suggested you find a café beside the Tuo River, sit down, and enjoy the night view! Enjoy morning free time in the ancient town. A short boat ride of 10 minutes on the Tuo River is a good experience to relax, and you can also explore the small museums and former residences inside the town. After lunch, hit the road and head for Zhangjiajie, about 4 hours away by car. After arrival at your Zhangjiajie city hotel, have a good rest. Breakfast at a 4-star hotel at Zhangjiajie is very basic, so our guide will prepare bread, coffee, and fruit for you. 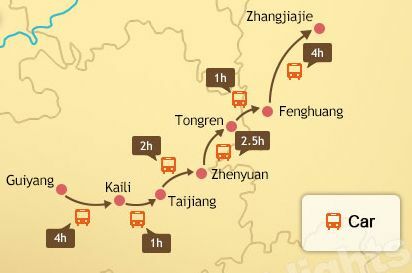 It&apos;s about 40 minutes by car to Zhangjiajie National Forest Park, a World Scenic Heritage Site since 1992. Take a cable car Tianzi Mountain and walk on the trails to admire large areas of grotesque peaks. Viewing platforms along the way allow you to see the scenery at different angles. Lunch on the mountain is very basic, and it is suggested that you bring some snacks. Local villagers sell fruits and food along the way, which are also good to try. If you prefer, we can arrange to have lunch at a McDonald&apos;s on the mountain, and have a break in the air-conditioned building. In the afternoon, take the public shuttle bus to Yuanjiajie Scenic Area, where recently-named Hallelujah Pillar, one of the inspirations for Avatar&apos;s floating rocks is located. For getting back to the foot of the mountain, besides taking the cable car, there is also an option of taking Bailong Elevator, a glass elevator built on the side of a cliff, taking only 2 minutes. If you are interested, tell your tour guide in advance so that he/she can arrange to avoid long queues, which might take you 2 hours. This area is a relatively newly discovered gem in Zhangjiajie National Forest Park, with pristine beauty and fewer crowds. It&apos;s a bit of an adventure, climbing steep and narrow steps to see the breathtaking scenery. Besides taking cable cars up and down the mountain, you will need to climb for about one hour on narrow mountain paths. If you do not want to walk so much, we recommend Gold Whip Stream for a pleasant stroll along the stream, surrounded by grotesque rocks. You might see some monkeys there. Please don&apos;t touch or scare them for safety reasons, but giving them food is ok.
You will knock on ‘Heaven&apos;s Door&apos; at Tianmen Mountain. Tianmen literally means ‘heaven&apos;s door&apos;, and the scenery of this area does match its name. To reach Tianmen Cave (a 30-meter-high, naturally-formed hole in the mountain) you will need to ride the world&apos;s longest cable car, walk on a glass walkway suspended 1,430 meters up, and ride on a mountain road with 99 turns. And that&apos;s not all: there&apos;s still a 999-step ‘stairway to heaven&apos; before you reach the hole. You will get back to the city at around 2 pm in the afternoon. After which is your airport transfer for your departure flight. While on the way to the airport, if you still have time, drop by Zhangjiajie Old Courtyard, the residence of an imperial official some 1,000 years ago, with well-preserved architecture and exhibitions of Tujia ethnic minority life. This tour is very flexible. You can extend it with an extra day to Fenghuang Ancient Town, near Zhangjiajie, where the daytime is picturesque and charming, and the night is lively; or add one more day to discover more at Zhangjiajie&apos;s national park (the entrance ticket is valid for three days). If your time is limited, shortening can also be arranged. We have included all the meals in some destinations, because restaurant choices and cuisine choices are very limited. We will try to arrange the best available at local authentic restaurants. This tour package in Guizhou section focuses on the undeveloped minority culture. Though the carefully selected accommodations are the best available, keep your expectations low. Your Guizhou tour guide will be available during the day until after dinner to help you. He/she can provide some things, e.g. disposable slippers, so that you enjoy the most possible comfort and relaxation. Star-rated hotels in Zhangjiajie might not be up to the standard of those in big cities like Beijing and Shanghai. The hotels we use in the tour are carefully selected based on criteria like hotel environment, location, service, and previous customer feedback. There are some hostels in the national park, with very basic facilities. If you would like to stay in a local guesthouse, we can arrange it. In this way you can save time on transportation, avoid tourist groups, and also cut the cost. In remote areas local people are very curious, and their kids gather around travelers for photos or small gifts (you might like to bring e.g. sweets for them). You may encounter minority festivals in Guizhou, please fit it in! Generally, on these days people will get together for singing, dancing or attend for bullfight with colorful dress. Lushen Festival held on Feb. 17-19 at Zhouxi county (20km from Kaili), Sister&apos;s Meal Festival held on Apr.14-16 at Shidong county (90km from Kaili), Dragon Boat Festival held on Jun.22-24 at Shidong county (90km from Kaili), for more information please consult your travel advisor.